Long ago, in my early years of working at a local hobby shop, a friend of my brother’s stopped in and asked what model my brother would like as a birthday gift. We settled on this Vette. My brother had built a few models when he was young but he never had a chance to build this kit. It ended up in my stash and sat there for nearly twenty years. A few years ago, I mocked the kit with a set of Pegasus wheels and found the motivation to start the build. My original thought was to paint the kit a code correct dark green from Scale finishes. I also pulled the trigger on a Model Car Garage photo-etch set. Very quickly, I finished the work on the engine and started prepping other parts. Then it stalled. 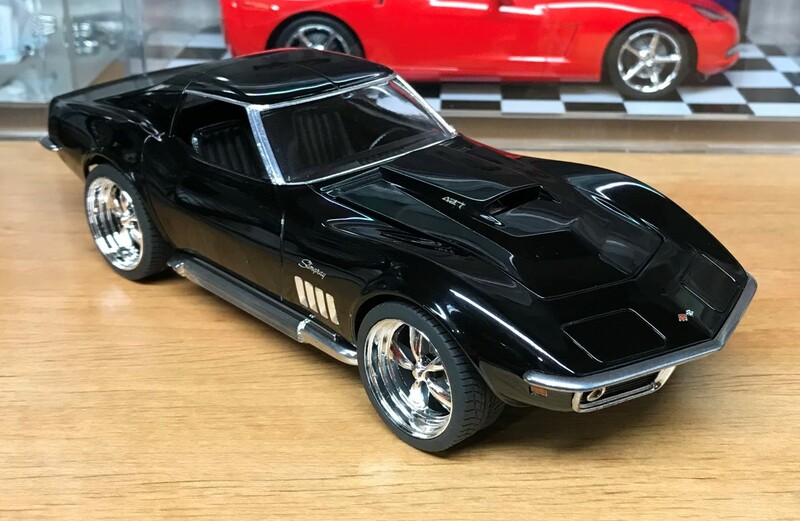 I found a picture online of this Vette painted in black with black ralley wheels. I tried finding Chevy ralley wheels without center caps but didn’t have any luck. I decided to stick with the Pegasus wheels and black for the color. In the nearly 25 years that I’ve been airbrushing my models, I’ve always avoided black. I was intimidated by the fact that any mistakes will be really obvious. It was time to give it a try! I sprayed it with decanted Tamiya gloss black and used decanted Tamiya clear. Once the body was painted, I moved on to finishing the interior with flocking, and photoetch parts. I really enjoyed modifying the steering wheel with photo etch spokes. For the chassis and suspension, I noticed that I needed to respray for a few different reasons. Once that was complete, I was able to finish the engine and chassis assembly. As intimated as I was by the black paint, the detail work was eve more so. I realized that the gills in the front fenders had to be chrome. I couldn’t decide if I wanted to try Molotow chrome or bare metal foil for work. In the end, I used both. It was a huge pain but it turned out really well. I had to strip and re-chrome all of the kit’s chrome parts. The chrome was transparent in some places or the parts had obvious mold lines and flashing. I stripped them, sanded all of the imperfections and finished them with gloss black and alcald chrome. Once that was done, it was time to move onto the photo etch. I was pleasantly surprised at how easy they were to use. I bought wax tipped sticks to hold the pieces and then used Tamiya acrylic gloss clear as the adhesive. I took the time to paint the flag emblems and I’m thrilled by the results. Almost 25 years after the initial purchase, the Vette is complete and I couldn’t be happier! Project introduction. I like the look of these wheels with this kit. I need to make sure the wheel well gap is kept to a minimum. I elected to paint the water pump and intake manifold aluminum to break up the look of the engine…it gives it a bit of an aftermarket look. The bulk of the engine work is complete. Now to start working on the rest of the project! This project sat on the back burner for a number of years. I never really had the motivation to really dig into it. After seeing an all black version of this car online, I decided to ditch my earlier idea of going with a color code correct green. This Vette will be the first car I’ve painted black since I started airbrushing models in ’94. I reworked the suspension to lower the Vette as much as I could. Going any lower would have required radical work. All of the suspension is glued in place. The stance turned out really well. It could be a hair lower. The black paint hides what’s left of the gap. I think I had to strip and repaint the hood twice. I sanded through the first coat, then dropped the hood and chipped a chunk of paint. 3rd time’s a charm. During a long dry spell in modelling, I did manage to sand and polish the clear. It took weeks to get it done given the time I put into it. I flocked the interior. I discovered that I don’t like using white glue while flocking this kit. It tends to make the carpet look really thin. I’m still happy with the results. I used bare metal foil on the window trim. All of the kit’s chrome parts looked terrible. Between being too thin and having heavy flashing and mold lines, I couldn’t possibly use them. I stripped them, prepped them and used Alclad to rechrome them. At first, this seemed like a daunting task. Once I started working to replace the steering wheel spokes with the photo etched version, I was pleased by how easy it was. I added photo etch pieces to the dash and finished the steering wheel. One great result of stripping bumpers is that I can mask the black areas of a grill prior to spraying Aclad. This is much more accurate than black washing a chrome grill. Nearly all of the pieces are detailed and read to be assembled. The dashboard is complete. Photo etch details have been added along with light dry brushing on the instruments. I used Molotow chrome for the bezels. The Interior is fully assembled and ready for final assembly. With the completed interior and chassis detail, it was time to bring the main components together. The alcald chrome parts look fantastic! Attaching the side pipe connecting pipes solidifies the marriage of the chassis and the body. I posed the project with the wheels. The end of this project is right around the corner. I was ready to move on to the photo etch detail and realized that the gills on the fenders needed to be chrome. Realizing that I needed to chrome the gills put this project on the back burner for a short time. I wasn’t sure how I wanted to do it. In the end, I used the combination of bare metal foil and molotow chrome. I finished detailing the brakes and glued them into the wheels. Once I finished gluing the rotors in place, I used epoxy to attach the wheels. After attaching the wheels, I wanted to black wash the lug nuts. As I started, I decided to black out the area around the lugs. I think it gives the wheels more dept. Prior to tearing into the last details, I got the bug to finish painting my Golf race car. I stressed over this detail more than most. I never thought I could get it right. I left the molded letters in place for reference. Using Tamiya acrylic gloss clear, I attached all of the photo etch pieces. It gave me time to align all of the lettering. Once the photo etch was complete, the project was complete. Using cheaters and a magnifying glass, I painted the photo etch flag emblems. The red flag wasn’t bad but that checker flag! Wow! This was a project that hung around for several years. Completing it and loving the results is extremely satisfying!